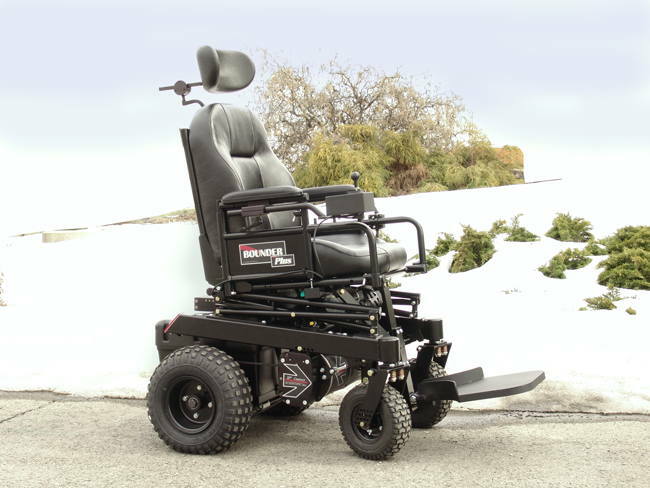 The photo on the left shows a popular configuration of a Bounder Plus H-frame with the off-road option, including Independent Drive Wheel Suspension (IDWS), self-supporting cantilever style arms (DL SS ARM), Center Mount Footboard (CUS CM FB), Comfort Company seating, Dynamic DX2 electronics and a lighting package with two 1800lm headlights. It is often ordered with our 24V 100Ahr LFP battery providing over 55 miles of real world driving range. Come winter, don’t get “snowed” down, drive a BOUNDER. It is ‘green’ and MADE IN THE USA! with Off-Road Package to keep on going even in the snow! take you to the beach this summer! 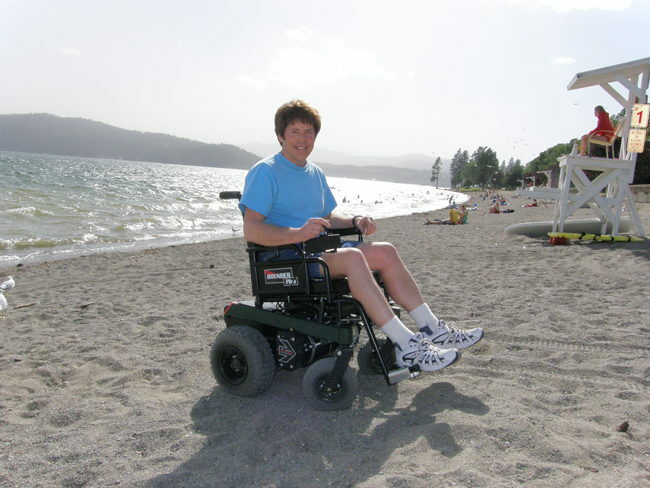 Do you want to go to the beach in your power wheelchair, but are afraid of getting stuck? 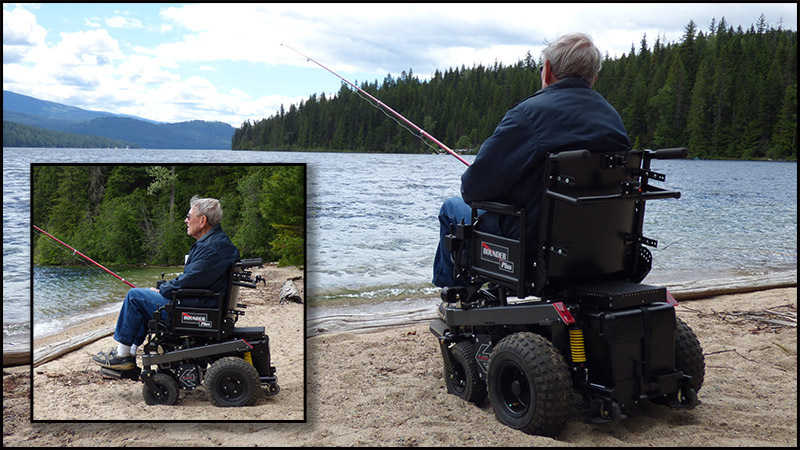 The BOUNDER Plus Power Chair with Off-Road Package will allow limited* travel on sand and loose soil. Power wheelchair users need their chairs. This is a fact. Good seating, smooth ride, and reliability are necessary. Sometimes it is also NECESSARY to traverse “off road”. Maybe your home environment is not all paved city streets. When the going gets tough, the TOUGH BOUNDER users really get going - going with the OFF-ROAD PACKAGE that makes it all possible! 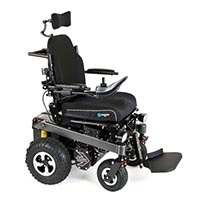 The special 13.5” x 5.40” low pressure pneumatic tires provide a very smooth ride. Going over rough terrain is no longer bumpy and jarring. The aggressive knobby tire design provides excellent traction when traversing loose terrain, mud or even snow. The Super Torque 4 medium speed motors have all the torque needed to climb steep hills. 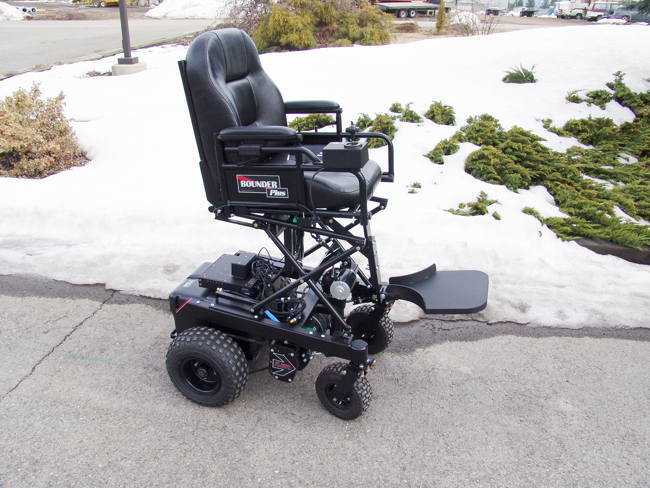 The Off-Road Option Package is what power wheelchair users want in a performance chair. Add other options to this package for a full featured chair. For example, add our stable seat elevator or a tilt system. Call our factory today and have your next BOUNDER custom configured to meet your life style. Don’t let your power wheelchair restrict your life. Make your lifestyle HAPPEN with a BOUNDER Plus with the OFF-ROAD PACKAGE. 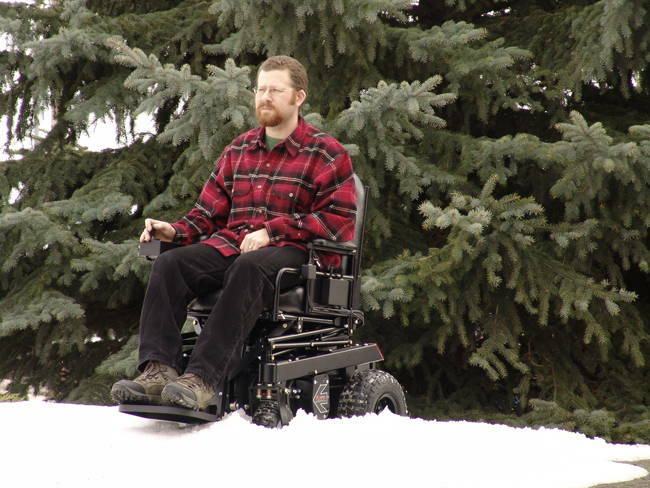 * Disclaimer: Never use your power wheelchair in unsafe conditions. When traveling off road, make sure you have someone to help you in case you get into trouble. Avoid unsafe hills and inclines that may cause your chair to tip over. Wear proper positioning straps, helmet and goggles if needed. 21st does not condone reckless driving of your power chair.